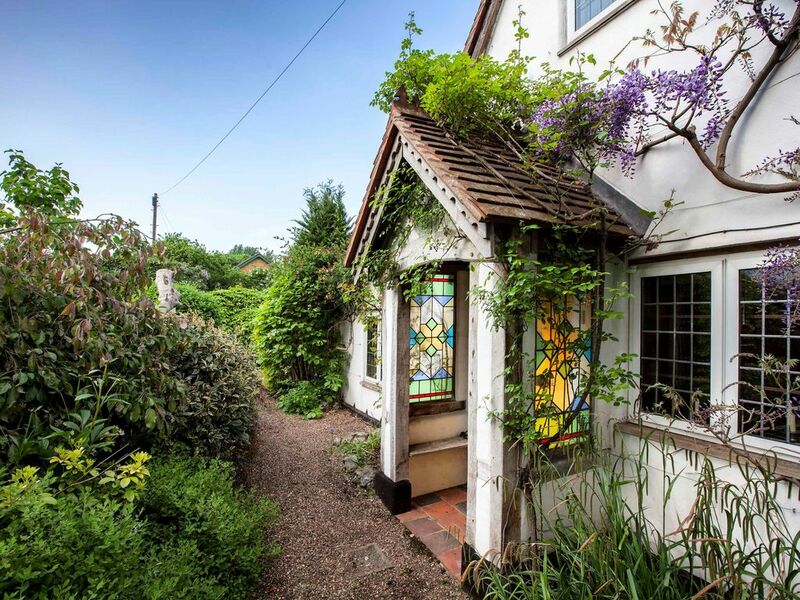 This charming detached Grade ll listed 16th Century cottage offers an abundance of beautiful character features, set in mature gardens in this beautiful Buckinghamshire village. It retains its original character combined with 21st century facilities and five star amenities. Behind a secure gate, Rose Cottage epitomises rural living and yet is less than one mile from railway stations (to London) and the M4 motorway. Rose Cottage is ideally situated a 15 minute car ride from Heathrow Airport and a short stagger to the local pub! Major supermarkets are less than a mile away. 15 minutes drive to Legoland. There is secure parking for two+ vehicles on site. The ground floor consists of a main sitting room with its wealth of exposed beams. Beyond, and accessed via double doors, is the third bedroom with a comfortable double bed and adjoining shower room facilities. This room can also be used as a TV/games room. There is a heated Garden Room to the rear of the cottage which enjoys superb views over the gardens and steps out onto a courtyard terrace with an oak table providing outdoor dining for eight. The kitchen has a comprehensive range of fitted base level units together with solid wood work tops. There is a range cooker and a separate utility room has the remaining white goods. Completing the ground floor accommodation is the breakfast hall, again with exposed beams and reclaimed stained glass windows. This is part of the original property dating back to the mid-16th century, with seating for six, as it neatly connects to both kitchen and sitting room. To the first floor are two bedrooms, of particular note is the master bedroom with vaulted ceiling, fitted cupboards and a King Size bed. The guest bedroom has a Super King Size bed that can be split into two Single beds. Travel cot and high chair available by request at time of booking. Rose Cottage has full central heating. Lake End Road, where Rose Cottage is located, is in Dorney Village, where the Olympic rowing took place at Dorney Lake and where cows graze on the common. 2 miles further is Eton College and historic Windsor, home to the Royal Family. The River Thames meanders close by and the village of Bray, where fabulous restaurants such as the Waterside Inn and the Fat Duck are located, is less than 5 miles away - approachable by road or by boat. You don t need to go that far though to see working farms, stables, the Jubilee River wetlands and open countryside which are all on your doorstep! In addition, there is a beautiful wedding reception venue close by (Dorney Court) and Rose Cottage would be ideal for the wedding party to stay. What a fabulous opportunity to enjoy the modern amenities within such a beautiful and exceptional English cottage. Impeccably decorated, iIt is comfortable and feels just like your home from home. The conservatory was my favorite spot to relax and listen to the birds. It is apparent as you step across the threshold how much attention is given to the details. You will not be disappointed staying here. We will be back! A lovely place to spend a weekend or longer holiday. It's much bigger than you expect from a cottage full of character, although some low beams and doorways! Kitchen and utility room is fully equipped and both bathrooms well designed. Lots of comfortable space for relaxing both in the lounge and conservatory. Would definitely consider staying again and recommending to others. We loved staying at Rose Cottage it was great for accessing some of the lovely towns and villages along the Thames. It was beautifully fitted out and very welcoming. We particularly loved the orangery. We had 4 different homes as we traveled through England; Rose Cottage was our favorite! We will stay here again on our next trip across the pond. Thank you so much for taking the time to send this lovely review. We look forward to welcoming you back! Delighted you enjoyed your stay and look forward to meeting you on your next visit! We fell in love with the cottage. Beautiful example of old blended with new. We could happily live there. Ideally situated for many atttactions. Suspect it might be cold in winter but we may have to try it to see!